Thanks to forward-thinking leaders, creative entrepreneurs and smart investors, downtown Tampa is experiencing an urban revival. Think of it as an old friend with a snazzy new haircut and wardrobe. The coolest changes celebrate the fresh new look while embracing the grand traditions that define the city’s history. While many of our readers live, work or play in downtown regularly, others may may not get a chance to experience the city’s distinct personality during the day or at night. So we are offering here our recommendations for a 24-hour visit as a grand adventure, especially if you haven’t visited for awhile. 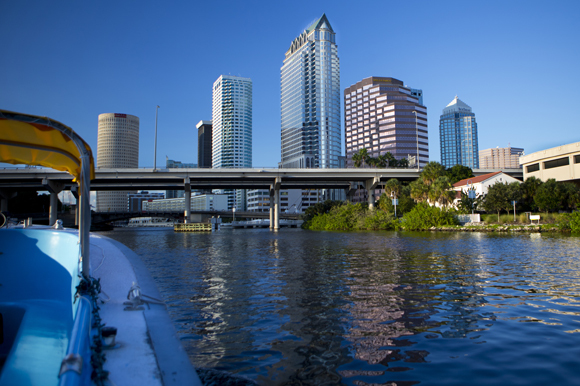 Read along as we explore our own walking tour through downtown’s waterfront views, head-back skyscraper vistas and toes-in-the-grass playtime in the parks — living like the locals, discovering new gems and experiencing tried traditions that define downtown Tampa as a foot friendly, food and beer lovin’ town. Check-in isn’t till 3pm, but even so, the ever-obliging Le Meridian (601 N. Florida Ave.) offers the ready room early if available. Front desk clerk Julie Parsons offers detailed info and no unnecessary fluff in a lobby that’s definitely upscale, but not snooty. Two smiling guests approach to check in and she greets them with a hug exclaiming “Welcome Back!” Pretty good for a hotel open only four months. Le Meridien is a new operation but feels well-established for a few reasons. It’s a Starwood property and, according to Parsons, the chain champions a “sensory experience.” They even pump out its signature scent, LM01 (a mixture of vanilla, musk and cedar) in the lobby to evoke a familiar yet adventurous emotion among guests. Artists develop a custom feel for each of their properties and at the Tampa location, local contemporary artist Amy Martz has created Tampa-centric pieces that adorn the walls. 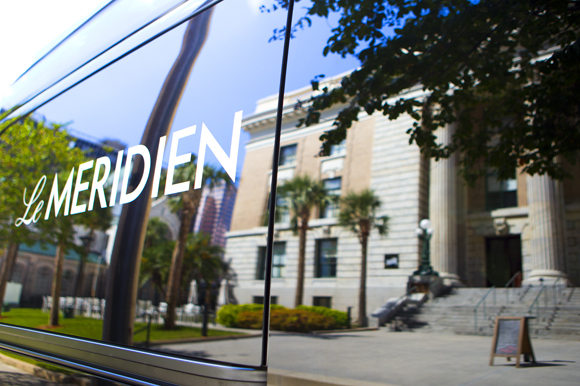 The main reason Le Meridien Tampa already feels like a local landmark though is because it literally has been for over a century. It’s the former Classic Federal Courthouse. The original marble façade facing North Florida Avenue is adorned with monumental columns and a grand staircase, but luckily for luggage-laden guests, the main entrance on Zack Street is sans stairs. Small touches of the former courthouse include doors still bearing former office names and wallpaper based on the blueprints of the original lighting fixtures. BONUS: A Le Meridian room key grants the holder free admission to the Tampa Museum of Art as part of their “Unlock Art” program. 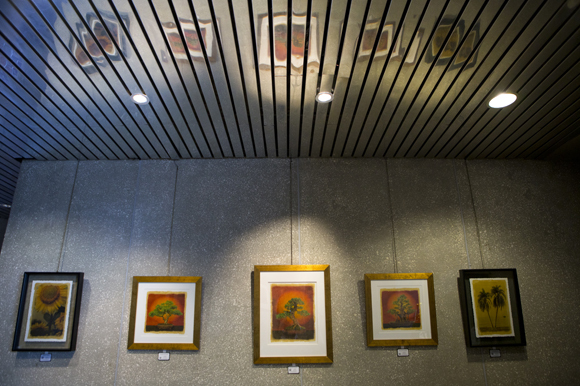 Pop into the TECO Public Art Gallery (702 N. Franklin St.), an easily overlooked spot on the spacious ground floor of TECO Plaza, headquarters for Tampa Electric Company. The TECO gallery is free and open to the public, and regularly features works by local artists. A past show exhibited a variety of photographic art by Jim Swallow. The current exhibit, titled ARTWORKS 2014, features 30 pieces representing a wide range of Tampa bay artists in various mediums. Shoe shine chairs at Reina Shoe Repair on Twiggs St. While Tampa is experiencing a downtown revitalization, there is a wonderful mix of fresh face businesses among those steeped in tradition. 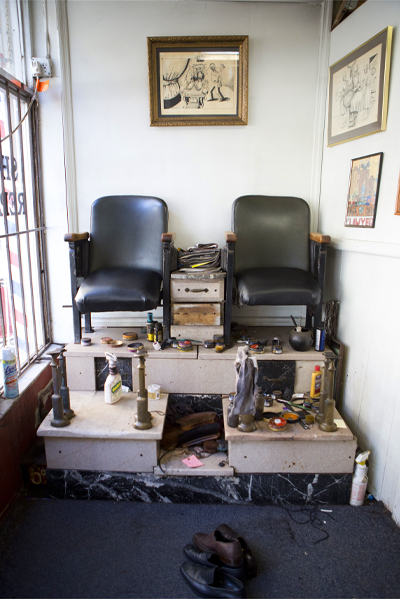 Many miles have been walked on the soles that enter Reina Repair (305 E. Twiggs St.), a shoe shine stop and workshop. According to Ed Aris, his family has run the shop since the 1920s and it is the oldest shoe repair shop around — not to be confused with the cool looking but defunct Florida Shoe Hospital (406 Zack St.) a few blocks away. The scent of leather and polish combined with the hammering of rubber to sole among shoe-themed decor is a step back in time, as is the banter between Aris and the regulars that stop by the shop. Time travel continues next door at Artisan Edge Barber Shop (307 E. Twiggs St.). Seen through the locked front door (by appt. only), Master Barber Frank Levva sports a crisp white shirt, black suspenders, Dali-esque mustache and wire-rimmed glasses as he works artfully with a straight razor on a frothy faced customer. Some interesting fresh faces for foodies now dot the Franklin St. food scene like Crum & Cork (501 N. Franklin St.), Urban Juice Co. (510 N. Franklin St.) and the newest addition, Holy Hog Barbecue (302 E. Kennedy Blvd. ), a prime people watching spot with plenty of outdoor seating on the corner of North Franklin and East Kennedy. While reinventing the Cuban sandwich seems more common than the original these days, Holy Hog’s version is a reasonable stretch. Called a BAR-B-Q’BAN, it is described as a redneck version of the Tampa classic — pulled pork with country ham, swiss, mustard and pickles on a toasted bun. Duncan is asked to sit for a portrait and at first seems hesitant, but then pulls his measuring tape from the machine and drapes it over his shoulders resembling a symbol of academic achievement over a graduation gown. He leans back in his chair like it’s a throne, the words “expert tailoring’’ read backwards through the front window above his head. It’s a fitting scene. Excerpts for the pedestrian reading a historical plaque: “Near this site … once stood a large Timuquan Temple Mound dating before the time of Christ …. 50 feet in height … elaborately decorated temples and residences of Indian chiefs and shaman had stood. “Fort Brooke soldiers, in the 1840s used a tall Gumbo Limbo tree growing at the crest of the city-block long mound as a lookout post. “The ladies enjoyed ice cream parties at the summit in a beautiful Chinese pavilion …. In 1882, the mound was razed to fill the Jackson Street ditch …. The Sail Pavilion (333 S. Franklin St.) is operated by the Tampa Convention Center, but is worlds apart. It’s kind of like a mullet. 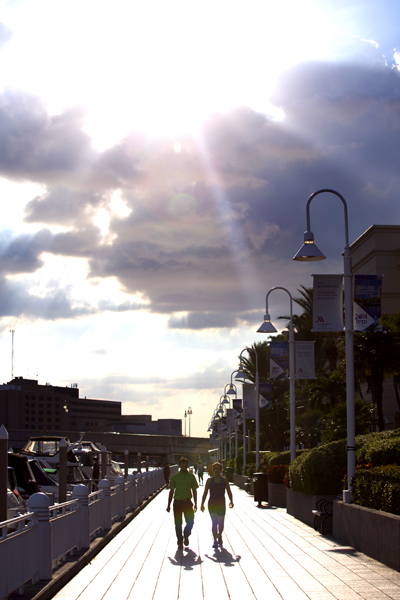 The convention center is business in the front, while Sail Pavilion is the party in the back. Maybe more appropriately, the Sail Pavilion is the Convention Center’s cabana house, and the Hillsborough River its pool. Tonight, the extra draw at The Sail is Brews & Bites. Every second Friday of the month, live bands and food trucks prevail. “I Wanna Wok,’’ a truck wrapped in flames and brandishing a star-eyed panda, offers The Boom Box ($8) with Korean bulgogi beef, Asian slaw, vegetable spring roll and fried rice. Pair this with Sail Pavilion beers and music, watching SUP’ers paddle in and carry their boards up to join the party. Capt. Larry Salkin pulls up in a tour boat adorned with a taxi-yellow bimini top. It’s not an over-polished operation, but transportation with a view, perfect for locals looking for a new perspective of the city. Bobbing under bridges, car tires whine on metal grates above as shadows from the boat ebb and flow along the sea walls. The sinking sun giving the Sykes building a golden glow against a brilliant blue sky, an impressionist version of the scene dancing in the wake. Slipping into the dock at Curtis Hixon Park, the scene is festive with children on playgrounds and beer festival revelry beneath the sleek silvery angles of the Tampa Museum of Art cutting into the sky. Across the river, University of Tampa students lounge on the grassy lawn and in hammocks tied between palm trees, below towering minarets. According to Friends of the Riverwalk, the plan was conceived by Mayor Bill Poe in 1975. It’s still a work in progress, but it’s working. Wearing a safari style hat and a bright yellow shirt reading Tampa Downtown Partnership Guide, Christopher Thompson, a third generation Tampanian, talks with pedestrians along the Tampa Riverwalk near the Straz Center. Guides like Thompson patrol downtown and offer visitors directions and suggestions, and even assist stranded motorists with flat tires and dead car batteries, all for free. Up the trail, golden light sifts through soft-topped grasses near a dead palm tree that’s been carved by a chainsaw into a tiki. It’s a random act of art-ness, which seems to be a trend, both in city sponsored projects and guerilla art. 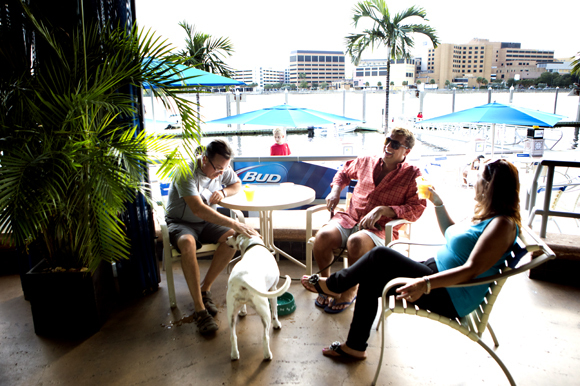 And since Tampa's City Council recently voted to allow open containers of beer, wine or liquor along the Riverwalk, more people are likely to enjoy happy hour strolls. It’s no BYOB invitation though, drinks must be purchased from approved vendors (bars and restaurants already established along the Riverwalk) and will be served in a special cup, so leave the red Solo cups at home. Ulele (pronounced You-lay-lee) on the northern end of the Riverwalk has become a sensation. The cuisine, based on native-inspired foods is receiving rave reviews and everybody knows it. A recent search on a Thursday showed the next available reservation for 2 at Ulele was Sunday at 8:45 pm. If you show up without one you may be out of luck, and don’t expect to belly up to the bar either as competition for a drink can be fierce. Instead, admire the renovated Tampa Water Works Pump Station from the exterior as you make your way to the relatively peaceful beer garden picnic tables or upstairs patio. Order a mug of Ulele-brewed beer and follow the winding path to the little bridge overlooking the Hillsborough River, which by this time matches the pastel palette of the sunset. You can find an opening of some sort almost any night in Tampa, and the grand opening of 8-Count Studios in the old Rialto Theatre building (1617 N. Franklin St.) has flair. The 96-year old building had been dormant since 2005, but on the night of our visit, theatrics have returned to the Rialto stage. 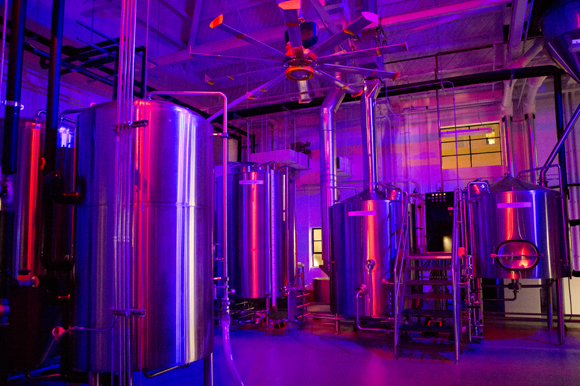 Despite the sketchy ambiance of the block, some of the best spots in Tampa are close by. Cafe Hey (1540 N. Franklin St.) offers great coffee, food & community events, Oceanic Supermarket (1609 N. Tampa St.) is a fantastic Asian market and Fly Bar (1202 N. Franklin St.) has a great happy hour and rooftop view. Each is a diamond surrounded by unpolished environs, and now the Rialto Theatre is blinging. The scene inside is modern and pristine; white furniture, curtains and ceilings. A dramatic archway is the star of the architectural show. It’s the perfect framework for a stage, even though there is none. Performers find their way to where it once stood, trading dance moves among a mix of techno and trance. Behind the scenes, its rugged brick and wood skeleton is exposed with large window-sized holes stage left, held up by an exposed iron girder. It’s a fantastic space. 8-Count Productions has rebuilt the new Rialto Theatre from the bones up as a hybrid gallery, event space, photography and dance studio. Tonight it fits all of the above. 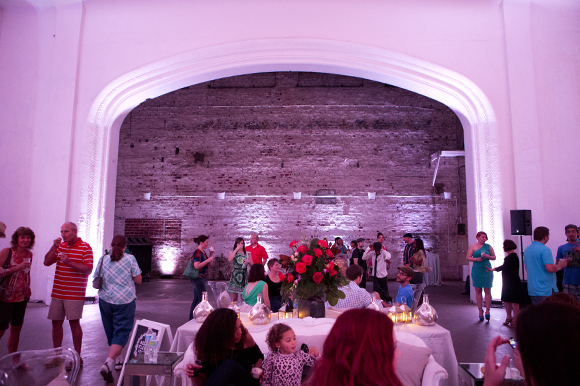 Guests mingle in a gallery space erected next to an open loading dock as cameras flash where you’d expect a spotlight to fall, on co-owner George Carter II teaching “Never Have I Ever” Blogger Allison Vetter how to “pop” on the dance floor. Orange sodium streetlights and a nearly full moon light the walk back downtown along North Ashley Drive, but both are outdone by a shooting star burning across the skyline, its juxtaposition seeming as if it would nearly skim rooftops as it stretches towards the horizon. Anise Global Gastrobar (777 N. Ashley Drive) offers an inventive Asian fusion menu and plenty of eye candy on busy nights. Sepia-toned images and travel paraphernalia from far off lands frame a beautiful bar and a heavily chandeliered dining room. 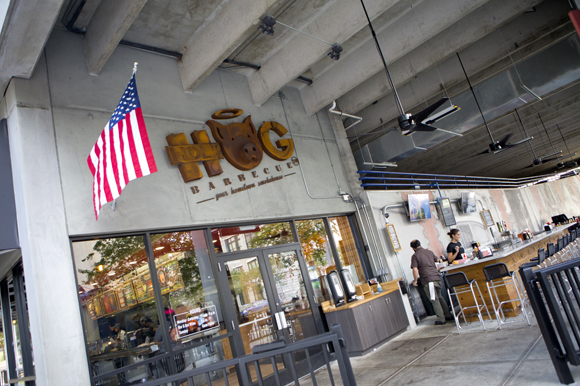 Outdoor tables offer a view of the heart of downtown facing Curtis Hixon Park. 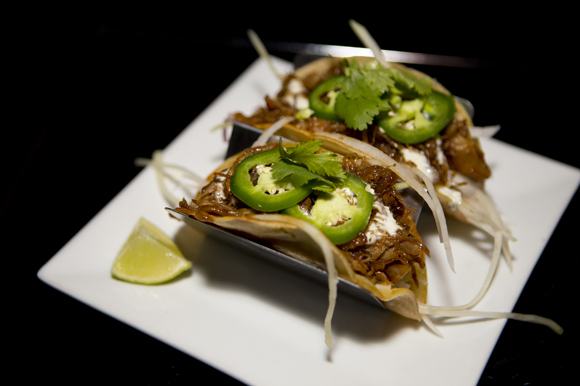 Craft cocktails earn praise, as does a plate of wonderfully spiced duck confit tacos ($11) with pickled daikon radish, spicy jalapenos and hoisin bbq. Ramen noodle soup with pork belly, fish cake, mushrooms and hard-boiled egg ($12 add kimchi for $1) is just cause for succulent satiating slurps. The twinkling lights of The Tampa Theatre (711 N. Franklin St.) impress on the stroll back to Le Meridien, but this time, we climb the marble staircase that leads to Bizou Brasserie (601 N. Florida Ave.) on the second level of the hotel for cocktails and French fare. 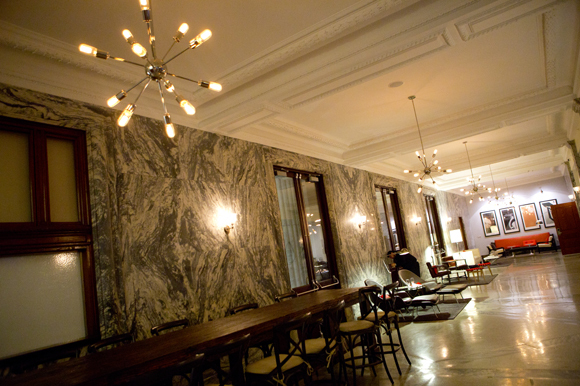 Cool zebra-colored marble walls and floors that used to serve as the Federal Courthouse now lead to the bar and restaurant where lawyer Paul Duval Johnson enjoys a cocktail. Johnson shares a unique perspective reflecting on both the new and old scenes from when he worked with the Hillsborough State Attorney’s Office. Outside The Hub Bar (719 N. Franklin St.), a double-decker bike and woman in snakeskin stilettos on a beach cruiser are a fun warm-up before entering what feels like a throwback to Tampa’s punk days. Our bartender warns some people were “11 o’clock drunk at 3pm” and concedes that the journal she writes in after work is probably enough for a book. It’s a hazy, tall boy PBR kind of institution with checkerboard floors with a drop tile ceiling. There’s a Galaga arcade game and a sweet Simpsons pinball machine, but drinking is the name of the game here — that and foosball. Bring cash for the bar, and quarters for the table, and you better bring your A-game, cause the competition is fierce. The bartender’s evaluation is confirmed when foosball almost leads to fisticuffs. It’s a rowdy, smoky mess, but in an endearing kind of way. Make a shot (or two) of espresso, as each room is thankfully blessed with its own espresso machine, then head upstairs to the Bizou bakery full of colorful and dainty treats. If this morning calls for some stick to your ribs fare, grab a coffee and hit the street while admiring characters like an older gent wearing athletic gear and smoking a cigar while a blasting boombox to share a salsa number with everyone within a three-block radius. She gives out warm greetings like verbal hugs at the cafe, which moved from Largo in Pinellas County to downtown Tampa five years ago. When asked if she’s related to the owners, Waitress Tara Mazzei, wearing a bright smile and a tattoo sleeve, says, “No, I’m the Italian from New York,” which is emphasized by the Yankees tattoo behind her left ear. You’ll like her anyway when she brings The Classic Fried Egg Sandwich with bacon ($7.99) and a side of biscuits and gravy for good measure. The sandwich arrives simple and perfect, the plate piled high with hashbrowns, and pleasantly surprising creamy and colorful gravy thanks to a healthy dose of paprika and parsley. Grab coffee to go and walk off breakfast by crossing the street to browse hundreds of titles on the sidewalk of Old Tampa Bay Book Company (507 N. Tampa St.). 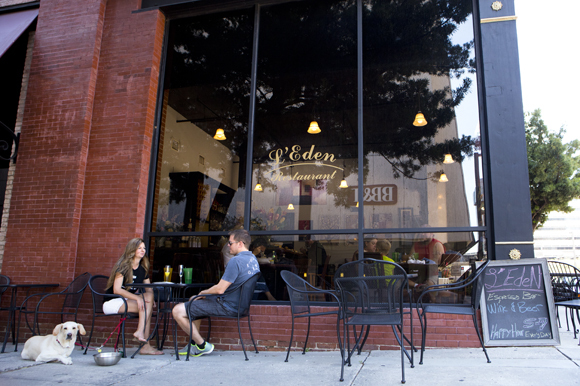 Then head back toward the Hillsborough River, past mimosa sipping couples with their canine pals at L’Eden (500 N. Tampa St.) before reaching Kiley Gardens (400 N. Ashley Drive), an easy-to-miss spot elevated from the street. Designed by architect Harry Wolf and landscape designer Dan Kiley, Kiley Gardens’ design is based upon the Fibonacci mathematical sequence (look it up). As the clock winds down on your 24-hour tour, find the concrete amphitheater at the water’s edge near the round Sykes building and climb to the top seats for a wonderful view overlooking the University of Tampa, Curtis Hixon Park and the entire downtown Tampa scene. Julie Busch Branaman, managing photographer at 83 Degrees, and James Branaman own Branaman Photography in St. Petersburg. Comments? Contact 83 Degrees. Follow 83 Degrees on Instagram to see our map of the locations mentioned in this article plus more fun Tampa Bay photos.